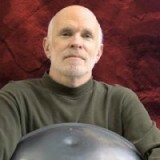 Michael Fitzsimmons is a percussionist, an award winning composer, and a performance and recording artist with Dancing Man Music.com. His most recent recordings include Skin on Skin (2002), which garnered him a Nebraska Arts Council Fellowship Award. Michael performs his Drums of the World concerts throughout the Midwest. He is a leader of full day music workshops with Creative Healing for therapists, school teachers, hospital teams, and individual groups. He is a skilled performer of diverse percussion instruments including drums, African instruments, Mbira (thumb piano), Plains Indian flutes, Brazilian percussion flutes, various bamboo flutes, and Hang Drum from Bern Switzerland.